"Es la segunda vez que compro y no será la última. Gran calidad y buen..."
Round beads of indian agate for jewelry. Available measurements of Indian agate round beads: 6 mm, 8 mm and 10 mm. Each string is about 40 cm long, regardless of the size of the beads. 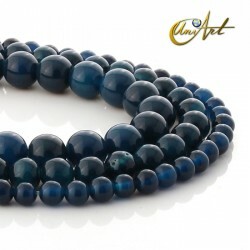 Dark blue agate round beads. They are strands with round beads of blue agate, perforated and lined, ideal to elaborate jewelery. You can buy these strands of round beads dark blue agate in the following sizes: 6 mm, 8 mm, 10 mm, 12 mm, 14 mm, 16 mm. In general, each strand has about 38 cm to 40 cm lenght. 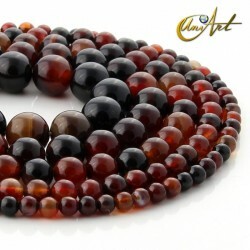 Strands of Faceted Brown Agate round beads in various sizes. 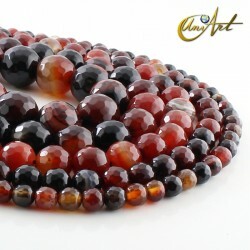 The brown agate also called agate miracle is an agate of shades that vary from brown to red earth. The brown or miracle agate beads are strung in strips approximately 40 cm long and available to purchase in various sizes. Brown agate round beads for mounting costume jewelery. These round beads of brown agate also called miracle, are perforated and lined in strands whose average size is about 40 cm. The options available to buy the brown agate beds are: 6 mm, 8 mm, 10 mm, 12 mm or 14 mm. This type of beads is ideal for assembling your handmade bracelets and necklaces. Indian agate beads shaped bone. Each indian agate bone shape bead is about 7 mm x 11 mm. The beads are enfilades on strands of approximately 40 cm long, each strand of indian agate bone shape beads, on average, weighs 30 grams and contains around 34 beads. The indian agate may have a mix of colors and terracotta tones but the predominant color is green. 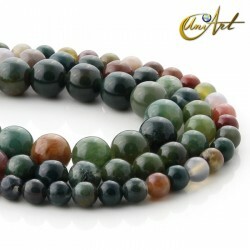 Strands of moss agate olive shape beads. 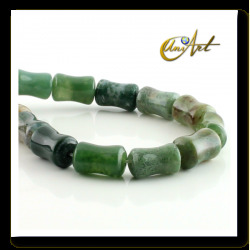 Each strand of moss agate olive shape beads measuring about 40 cm long, it weighs on average 35 grams and contains about 33 beads. Each moss agate bead measures about 8 mm x 12 mm. 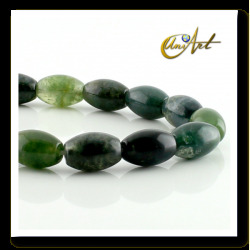 Moss agate is a natural semi-precious stone which has various shades but with a predominance of dark green. 10 mm round beads of Moss Agate. Measures: · Strand with about 40 cm in length. · Contains 36 balls and weighs 45 gr. approximately. 8 mm round beads of Moss Agate. Measures: · String with about 40 cm in length. · Contains 46 balls and weighs 35 gr. approximately. 6 mm round beads of Moss Agate. Measures: · Strands with about 40 cm in length. · Contains 60 balls and weighs 25 gr. approximately. Pink Agate round beads 14 mm. String with about 40 cm in length. Each string contains 26 beads and weighs 100 gr. approximately. Each bead measures 14 mm.